Yesterday I took a group of young people from a church in Austin, TX out to a village church so they could experience a house church. The church was in a village called “Koh Dat” which means “separated island”. It is not really an island, but it was so remote in the forest, that it got that name. Now, since many of the village as become Christians the government build a road to the village, so it is not very far at all anymore. Attending the service I asked the leaders there when was the last time they had celebrated the “Lord’s Supper”. They said it has been a few months. So, we decided we would celebrate it right then. They gathered what they had. A small loaf of bread which was ant-infested and a couple cans of warm coke. I must admit, I don’t mind having coke for the “wine”. Growing up in a Baptist church we never had wine anyway. It was either some grape juice or strawberry syrup just to get the red color. Coke didn’t taste that bad! All I had to do was brush off the ants (they don’t eat very much) and then I ate the stale bread. We had to share the glasses between four or five people, but we weren’t worried about germs. 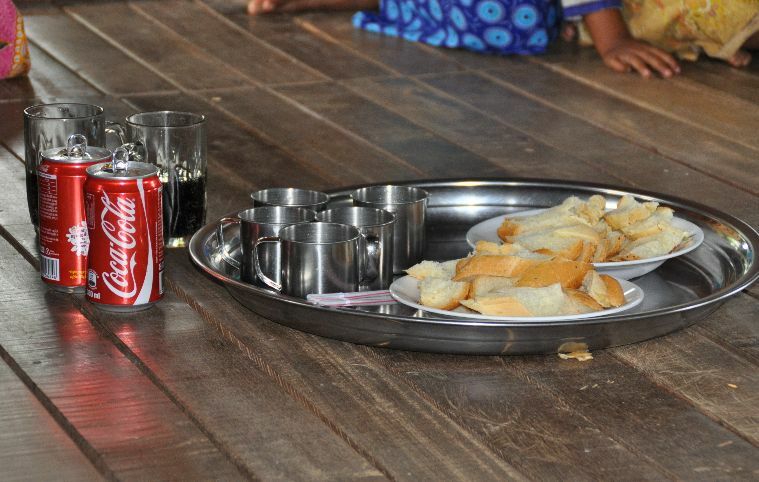 Actually, it might be surprising to you to have coke and stale French bread for the Lord’s Supper, but I want to let you know that there was nothing irreverent about it. It is simply the only liquid other than water that the village had at that time. Our time together, eating from one loaf to reflect on the suffering of Christ was a special moment. In that tiny little house in the Cambodian forest our gathering included Americans, Koreans, Chinese, Phnong (Cambodian minority people) and Khmers (Cambodian majority people). We were certainly the only mixed ethnic group in village that day and we were one; One in the body of Christ and loving each other. I think the Lord’s Supper we celebrated that day was a fitting tribute to what Christ has done! I never saw the 1Cor 10 scripture … Thank you. I love nothing more than using a loaf and breaking it apart for communion … and that scripture really resonated for me as I read it and thought of the last time I shared a loaf 🙂 … with about 40 kids in kids church … God is Good! 1 Cor 10 speaks of unity. Something us protestants need some work on. One loaf, we are one in Christ. I wholeheartedly agree which is why I love Ephesians. We are one loaf. Thank you. I love those meaningful communion services that are not conducted in the traditional American manner. I’ve had a lot of coke through the years in the Philippines as well.